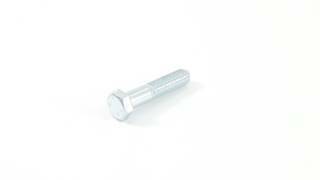 Constructed to provide a secure fastening as well as offer easy assembly, these partially threaded hex screws are designed to be used with a nut or into a tapered hole. Their versatility makes them ideal in a wide variety of applications and a useful addition to both hobbyists and professional tradesmen. Each screw features a strong and reliable steel construction with a hex head and zinc finish. These fasteners can be secured into place quickly and easily with the use of just a wrench or spanner. There are 10 pieces included in this package, and each one has a size of M10x1.0 and a length of 50mm.